Manager Nigel Adkins will be backed with funds to spend in his first season at Sheffield United - and over 90 per cent of Blades supporters would welcome a move for striker Billy Sharp, according to a fans’ survey on The Star’s website. Sharp was a big hit under Adkins’ tutelage at Scunthorpe United, Southampton and Reading, and speculation has linked the pair with yet another reunion at Bramall Lane. Adkins insists that no bid has been lodged for the Leeds United striker, but remains a huge admirer of the 29-year-old former United trainee. 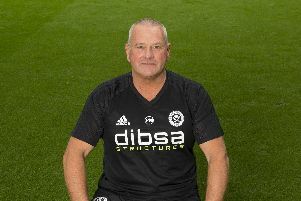 And Blades fans certainly agree; 66 per cent of those who responded to the survey would like Sharp back at Bramall Lane, while a further 24 per cent would welcome the striker - but only if the price is right. “If you look back at what we’ve done before, over the last few seasons, we’ve always supported our managers financially in the belief that it would make us successful,” Kevin McCabe, United’s co-chairman, said. United U21 coach Chris Morgan played with Sharp during his time at Bramall Lane. “I think it’s an obvious one to be speculated on,” he admitted, “and I think Sharpie has made no secret that he’d love another shot at coming and playing for the club. “I know Billy personally and I think he’d love nothing better than to come. The two spells that he’s had here, he feels that he’s not had the opportunity to show the real Billy Sharp. “People have always commented that he’s struggled here in his two spells and been a hit everywhere else and he’s gone and scored goals. United, meanwhile, will travel to Morecambe in the Capital One Cup on Tuesday, August 11 with a 7.45pm kick off. United will release ticket information shortly.